For those who don’t live or grew up in Minnesota or neighboring states, it may sound strange. But for those that do, it’s a signal to get your cash ready and win. It’s meat raffle time! The concept is simple, yet many still find it hard to grasp. Pay $1 for a number, pick it randomly from a drink tray of face-down numbers, the bar spins a wheel, if your number comes up you win meat. Like any game of luck, some have their own strategy to win. Pick from a certain area on the bar tray. Grab several numbers in an area of the tray. Buy up the last of the numbers left each time. What ever the strategy, it doesn’t make much difference. It’s all down to a spin of the wheel. Meat raffles bring out the desire to win at any cost in many. We spend dozens of dollars in an attempt to win what would likely cost $5-10 at any butcher shop. The price doesn’t matter. It’s about being a winner! So make a point to win big at a meat raffle on your next visit to Minnesota (or head to one this weekend if you live here). While you’ll find most meat raffles at bars north of the Twin Cities (usually during Friday happy hour or on Saturday afternoons), there are some around the cities too. Dusty’s Bar in NE Minneapolis has a meat raffle every Friday at 5:30pm. Part of the proceeds goes to The Northeast Lions Club and the meat comes from Hackenmueller Meats in Robbinsdale. Grumpy’s NE puts a bit of a twist on things with T-Bone Bingo every Sunday at 7pm. Get a bingo and win meat! 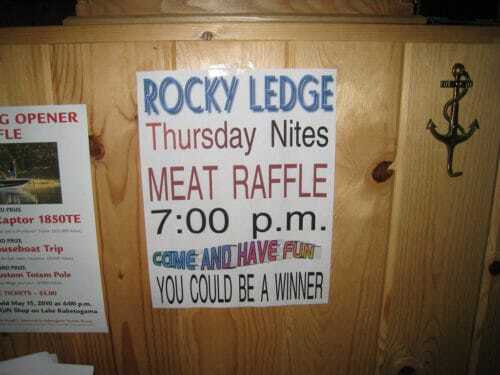 Come to Minnesota, become a winner, get dinner at the meat raffle.